MP3some | Movies | Style Weekly - Richmond, VA local news, arts, and events. “Nick and Norah” is the latest candidate in this year&apos;s hipster youth market sweepstakes. It&apos;s with something like the same deferential spirit that “Nick and Norah&apos;s Infinite Playlist” arrives on the scene. This adaptation of Rachel Cohn and David Levithan&apos;s popular young-adult novel has been so carefully contrived to become this year&apos;s “Juno,” the perky 2007 hit to which it brazenly genuflects, that one can&apos;t help rooting for it. That is, until impatience with the laziness of the filmmaking gets the better of our sympathy. In spite of a few clever curlicues and a dab of offbeat charm, this chronicle of teen love in downtown New York comes off thin and shoddy. The living link to “Juno” is Michael Cera in the role of Nick, a sweet and soulful youth not-so-recently dumped by Tris (Alexis Dziena), “on my b-day,” as he mournfully bleats to her voice mail. But when a stranger, a pretty girl named Norah (Kat Dennings), approaches at a club, asks him to “be my boyfriend for five minutes,” and promptly locks lips with him, the stage is set for sexual healing, and perhaps the emotional kind as well. Taking place almost entirely during a single, frantic night in Manhattan and Brooklyn, and especially in the small clubs favored by the very young, “Nick and Nora” clearly has zeitgeist-defining aspirations. In fact, the abiding love depicted here probably isn&apos;t Nick and Norah&apos;s for each other or for the troublesome exes they can&apos;t seem to stay clear of, but rather the love of all of the characters for the music they&apos;re sure embodies the era. Conversation in this film consists chiefly of swapped allusions to the arcana of indie rock, the object of a consuming enthusiasm that these kids&apos; predecessors in the &apos;50s might have shown for Lester Young or Thelonious Monk. The story of music as the new religion of the young is not a new one — Plato has some tart things to say about it — but every generation re-creates it in its own way. 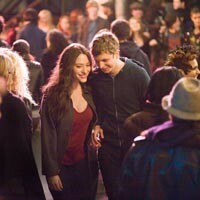 In “Nick and Norah,” Tris&apos; villainy is exposed when she messes up the name of Where&apos;s Fluffy? — a fictional band that all the good people recognize as the holy of holies. The film&apos;s slim plot revolves around the search for a secret, wee-hours Where&apos;s Fluffy? concert. The sin committed by Norah&apos;s repellent friend with benefits, Jay Baruchel, is a hankering to take his own band commercial. And Nick and Norah take several steps toward romance when they discover their love of the same obscurer-than-obscure groups. It&apos;s taken for granted that if romance blooms, there will be a triangular relationship consisting of Nick, Norah and the iPod. We&apos;ll never know what sharp, witty film might have emerged from these promising elements, because they get shoved aside for the oppressively uncreative hijinks that crouch at the center of the movie. Undoubtedly the moment that&apos;s been engineered to bring the crowds in comes when Norah&apos;s drunken friend (Ari Graynor) tries to screw up the courage to retrieve her cell phone, along with her chewing gum, from a toilet into which she&apos;s just vomited. The guiding principle of first-time screenwriter Lorene Scafaria seems to have been to address teenage sophisticates in the audience from time to time, but never to take her eye off the barf-and-beer-bong crowd for long. All hopes that “Nick and Norah” will manage to evade the generic fade when Saturday Night Live&apos;s Seth Meyers shows up to commandeer Nick&apos;s car, a yellow, retro-precious Yugo that keeps getting mistaken for a taxi and, in this case, gets turned into an icky love nest. A quarter hour after Meyer&apos;s disappearance, his SNL colleague Andy Samberg shows up for an equally distracting throwaway exercise in cross branding.